This is probably the most non-electric device to ever be plugged into an outlet. I’m usually in desperate need of more outlets thanks to living in a very old house. However, if you have outlets to spare then this is one way to make sure that they stay packed full. Yet your power bill will never go up and you’ll get a bit more lighting. 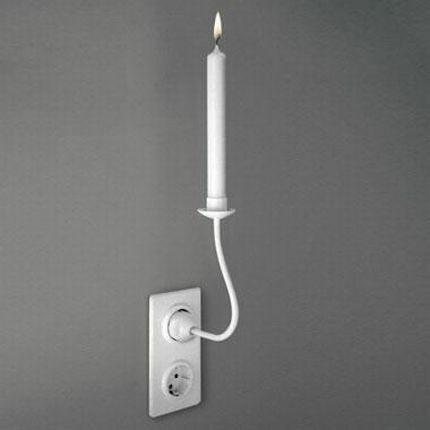 The down side of this strange candle holder is that if you have some drippy candles then all the cords and flooring below are going to end up a bit more waxy. Alright, so it won’t shine as brightly as a lamp being plugged into the wall, but at least it’s better than absolutely nothing. To purchase your very own it’ll cost you about $24. Although one small suggestion, buy non-drip candles.